Mary Avery Kabrich began her writing career at age nine when her sketch pad transformed into a vehicle for crafting thoughts into meaningful code. She grew up amongst cornfields in central Minnesota at a time and place where no one understood dyslexia. Having been told, ‘you can’t write if you can’t read,’ she set aside her story telling ambitions and did her best to compensate for the trials of being reading challenged. She did however continue to write in her journals. Mary made education her career. She started out as a special education teacher, teaching other struggling readers how to read. Later she obtained a PhD in Educational Psychology from the University of Washington where she attempted to gain an understanding of “why some children learn to read as effortlessly as bird learns to fly, while others flap their wings so hard they almost break and still end up in a nosedive.” Currently she divides her time between working as a school psychologist diagnosing and supporting children with various learning challenges, and writing her next novel. “Once Upon a Time a Sparrow” is her debut novel. A fictionalized portrayal of her own experience both as a child and later as an adult coming to terms with a condition she had learn to hide until very recently. Welcome Mary and thank you for being with us today! Why don’t you start by telling our readers a bit about your journey to becoming a published author? I always wanted to be a writer, which in my mind meant writing novels, but never shared this with anyone else, understanding that people who don’t read don’t write. Not only had I struggled with learning to read, my spelling remained atrocious well into adulthood. I needed remedial help to get through college English 101 which I passed on the second attempt at a community college. I never took a literature class or any kind of basic writing course as I knew I would fail. In my mid-forties circumstances in my life brought me to therapy. What emerged was the shame I experienced around my reading failure and my unachievable desire to be a writer. As I began to resolve these issues I spontaneously began writing my story – from a nine-year old’s perspective. I wanted to introduce her to the world in hopes that teachers would understand their impact, both positive and negative. Later I realized it was incomplete – I also needed to share the story of the school psychologist who hid her past. My journey to publication could be summed up as twelve years of revisions and hours upon hours of editing help. I learned to write while writing this story. I attended workshops and a couple writing conferences. I met two other serious aspiring novelists and we have met and critiqued one another’s work two times a month for ten years. 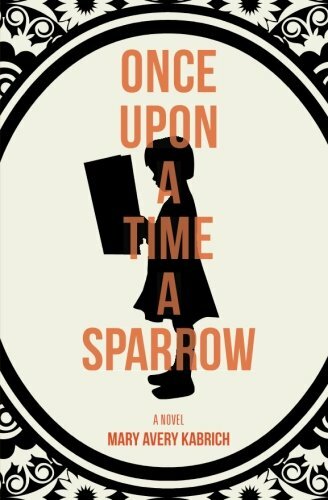 What is “Once Upon a Time a Sparrow” about? On the most basic level, this story is about life-long emotional damage when a school community narrowly defines success and neglects to celebrate strengths. Dyslexia is only one of many learning differences a child may have that untreated can lead to complete school failure. On another level, to quote one of my reviewers, “the story of story itself, with its power to lift us and transform our lives.” Story telling has forever been a part of the human experience. Whether we are aware or not, we all tell ourselves stories. Our personal narratives can limit or expand us. Maddie adapted her teacher’s story, The Fairy Angel’s Gift, to confront her fears and hopes. My title, Once upon a Time a Sparrow, reflects the shift in the personal narrative Dr. Meyers adopts following her resolution with her past. This story is also about the dangers of denying one’s past, how our imperfections can make us whole, and the abundant possibility of transformation at any stage in life. Before we go any deeper I want to congratulate you on your recent awards! For our readers, “Once Upon a Time a Sparrow” took home the 2017-2018 Reader Views Reviewer’s Choice Awards for Best Fiction Novel and the Jewel Kats Special Needs Award! Talk about your reaction to this news and what it means to you as a debut novelist. To be honest, initially I was stunned. This made me realize I am still wresting with my old narrative of a person who lacks literary ability even though I have received wonderful reviews. Changing one’s narrative of self takes time and vigilance. Winning these awards are, and will continue to be, an incredible source for growing my confidence as a writer. I am thrilled! In my novel an acorn shows up as a powerful metaphor. We, as parents, teachers, caregivers to one another are essentially amid acorns that have an innate mission to grow and transform. We facilitate growth in one another when we can look beyond current appearances and see the mighty oaks that will emerge. One of the most valuable gifts we can give one another is the recognition that something great lies within waiting to be cultivated. Well-written fiction which introduces me to characters and situations with which I have little personal experience, providing me the opportunity to gain a deeper understanding of the multitude of circumstances others endure. I love that reading literary fiction has been shown to increase one’s level of empathy for others; it certainly does for me. These days I insist on only reading stories that end with a sense of hope. This is a difficult question. I guess the answer is no – otherwise it would not be so difficult. For years I collected books and loved the idea of reading but never actually read the books. I read slowly which works for dense non-fiction. Within the past eight years I discovered audio books and joined a book club. This has transformed my relationship with fiction – and helped tremendously with my writing of fiction. I now listen to get the benefit of “reading” the story in a timely manner. I often then buy the book and re-read my favorite sections. This past year I have especially enjoyed: Jodi Picoult’s Small Great Things, Celeste Ng’s Everything I Never Told You, Karen Joy Fowler’s We Are All Completely Beside Ourselves, and Laurie Frankel’s This Is How It Always Is. Talk about your writing process. Do you have a special routine or ritual? Do you write daily? I love writing and make time for it nearly every day. On weekends I return to the week’s drafts and begin editing to find the nuggets that I will keep and refine in my current novel. What can you tell us about your new novel? The characters and plot are quite different from Once Upon a Time a Sparrow. This story takes place in 2014 in a small town outside Boulder, Co., the place Mariah chose to start over with her one-year old daughter. Now 13, her daughter Star is beginning to ask questions about their family’s past, questions Mariah is not ready to confront. Like Once Upon a Time a Sparrow, this story also reveals the dangers of denying the past, and the possibility of transformation at any stage in life. Being a writer has provided me a new lens with which to see the world. Everyone, including myself, is a character. All characters are complex with incredible strengths and vulnerabilities. I feel my compassion and understanding towards others has increased. Being a writer has sharpened my awareness of “the subtext” that plays out between people. What is said and isn’t said and how we all unwittingly communicate our desires and biases in physical and subtle unspoken ways. “Best…ever” is intimidating. Certain quotes, advice, and ideas have entered my life at the right time and then were replaced by others. In this moment what comes to mind is this quote by Einstein: “Imagination is more important than knowledge.” When I believed technical skills were needed before I could begin writing, I didn’t write. When I understood that my imagination was full of stories to be told, I got started and learned the writing craft as I worked. Allow yourself the space and permission to write your first (second and third if need be) draft without an inner critic. Begin the story and get it moving without judging the writing. If you are serious about further developing your piece of work, you will have ample opportunity to scrutinize each and every word. I believe there is wisdom in letting our beginner self be thrilled with taking simple, uncensored first steps. I wonder how many perfectionists lose their passion on the crucifix of comparison. I live in an old, inner city neighborhood and love walking or jogging around. I have a Little Free Library on my front lawn and delight in the book exchange that takes place there almost daily. I love my community and like to see my regular people around and about. Listening to an audio book while weeding or pruning in the garden. Do you have a website where readers can learn more about you and your works? Yes, my website is www.maryaverykabrich.com. Connect with me on Facebook, Twitter, and LinkedIn! Yes! If you are a person who has set aside your desire to write your story due to doubts about your skill or talent – I want you to know that if someone with my reading/writing/language challenges can write a successful novel, then so can you, if you’re willing to persist.